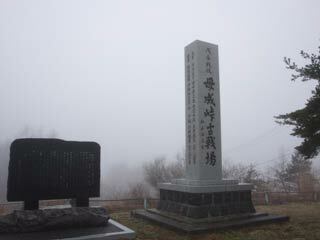 The battle of Bonari mt.pass (母成峠の戦い) is one of the battle scenes of the battle of Aizu. It was happened between Aizu domain and Meiji government in 1868. Saito Hajime and his Shinsengumi joined this battle. There is a parking but no restroom. Need a car to visit. Drive Banetsu express way to Inawashiro-Bandai Kogen. Meiji Government(2,000) v.s. Aizu Domain and Shinsengumi (700). Commander of Meiji: Itagaki Taisuke and Ichiji Masaharu. Commander of Aizu: Otori Keisuke and Saito Hajime. It is one of the battle scenes of Boshin War in 1868. Bonari Mt.Pass is one of the entrance to AIzu Domain. However, because it was located deep in the mountain, Aizu didn't place a large numbers of defense force in this place. The defense force was consisted with Aizu soldiers, Shinsengumi, Nihonmatsu soldiers, Sendai soldiers and Denshu-tai. The battle began in the morning. However, Aizu soldiers run away immediately and left all others in there. Because, Meiji Government army had a bigger number of soldiers and western weapons, by the evening time, they defeated Bonari Mt.Pass. After this battle, Itagaki didn't stop his army and he attacked the city of Aizu within a day.